Compiled by JC Brochard on july 3 1981. Cover photo : JC Brochard Attic of 39 rue des Martyrs de la Résistance in Châlons-sur-Marne, toward 1980-1981). "Can I interfere in your crisis ? No, mind your own business"
" Let me out... Let me out... Let me out... I can't stand the dark anymore"
Will the muzak never end"
Here are the young men, well where have they been ?" And you're the one who makes the choice To turn me on or turn me off But now it really matters"
Even the greatest stars discover themselves in the looking glass"
13. THE MONOCHROME SET : In love, cancer ? As the final day falls into the night There is peace outside In the narrow light"
Certains de ces bonus ont pu être publiés initialement après la date d'enregistrement de la cassette originale. ils ont été choisis parce qu'ils complètent utilement la cassette originale, pas par souci de rigueur historique. I've heard them all, no mercy shown Heaven knows, it's got to be this time"
Then there came the day, we threw it all away"
Le temps est si lent, pourquoi nous presser ?" The best years of their lives, in this world of no-no-no"
No visible means of support"
You are the product of your time. I didn't grow up with the mania of the sixties, the utopia of the hippies, the rage of punks or the hedonism of house. I didn't care for heavy metal, contrary to 80 % of the people around me. Early in July 1981, expecting my A level results within a few days, and before going out to the Exhibition Hall for the big party held to mark the end of the exam period, here's what I was listening to, in the days of new wave, that some were starting to call cold wave. The cassette compilations that I made for years mainly served to keep track of my favourite songs at any one time and to listen to them in a convenient way, even before I had a car. The track listing could sometime be thematic, but the newness of the records in my collection was the prevailing factor. Which can explain why you find The Specials here, a little lost in a rather dark atmosphere. Talking Heads had recently evolved in a new direction, but "Listening wind" is maybe the less "ethnic" track on "Remain in light". Anyway, even if it's a rather somber new wave that dominates the cassette, it is in no way all-pervasive since, along with The Specials and Talking Heads, you can also hear The Clash with the "Sandinista !" song that references "Apocalypse now" and the closing track on Monochrome Set's "Love zombies", which is in no way synthetic. 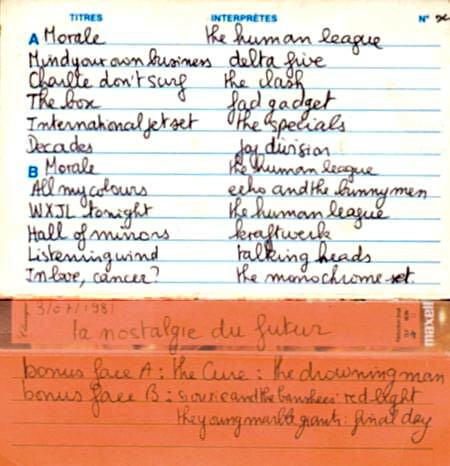 If there is a song in the lot that is the source for the theme and general tone of the cassette, it is "WXJL tonight" by The Human League (though the lyrics for The Buzzcocks' "Nostalgia", featured in the bonus tracks, could have done the trick). 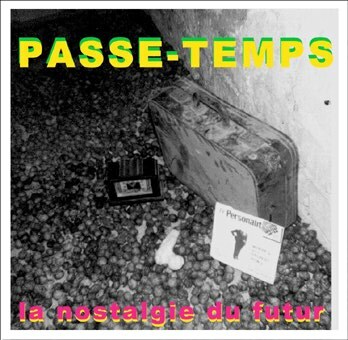 The title, "La nostalgie du futur",I found it by myself, even if I thought it probable at the time that someone had coined this expression before me, but it was probably suggested to me by the lyrics to "WXJL tonight". The song tells the story of a radio DJ in the future (twenty years from 1981...) addressing his listeners, or precisely the last of his listeners, asking him not to turn off the radio, because it would mean the end of the station, and the end of himself. Nobody anymore listens to the DJs talking about the songs, and they are being replaced by automatic stations. In the "Travelogue" album, there were other striking songs, like "Life kills", which proves that music can also act like a metaphysics handbook; and strongly influence a sensitive mind ("Life kills" could also be linked directly to the name of the site that hosts this text...). At a time when the playlisting of proper radio stations is entirely enslaved to computer programs deciding the order of the calibrated songs and pieces of news according to a number of criteria. At a time especially that sees the development of internet radios, podcasts and radio-blogs, all you can say is that the future is now and that today, "WXJL tonight" is a not a futurico-nostalgic song, but truly and properly a song of our time. In the last two years, young bands have formed and found success, sometime by reproducing note for note the music of bands from 1981.The bands from the past take this opportunity to reform or go on tour. All of the titles featured on the original compilation are available for sale today (including the most "obscure" one, "Mind your own business" by Delta 5, thanks to a recent reissue by Kill Rock Stars in the United States), and that's a good thing. The most eagerly anticipated music film of the year in England us the Ian Curtis biopic, to which New Order will contribute new music. Time has passed. My cassette is unlistenable (it stayed for several years in an attic with abrupt differences of temperature), but I still own the records that were used to make it. Time has passed, and music is still a pastime for me, one of the art forms for which duration is the most important. A record remains a slice of time that you can't speed up, and it can also be a nostalgia capsule which, everytime you play it, sends you back as an echo to the time of one of your previous plays. J.-C. Brochard, 30 avril 2006.